After over a two-year break, Sony has finally got back to putting out a new APS-C sensor mirrorless camera, this time the A6400. More on it in a bit. I always found that progression a bit strange, as the A6500 came so fast on the heels of the A6300. Because the main changes were the addition of the touchscreen and sensor-based stabilization, it almost looked like the A6500 was the real A6xxx update and the A6300 was more a placeholder. Sony continued selling all three A6xxx models, which gave them a crop-sensor "lineup", though one that seems a little confusing. Today Sony confused things a bit more with the introduction of the A6400. But let's start with the good news: Sony seems to be rededicating themselves to getting the lower-end crop sensor lineup back running now that the full frame models have matured nicely and held serve. Besides the A6400, there's the fairly substantiated rumor of the A7000 coming soon, which is really a D500 and 7Dm2 targeted camera (basically the A9 with an APS-C sensor instead). Sony's been up and down with mirrorless sales, as the above graph from Japan market sales might suggest (Percentage of market on left [.4 is 40%]; Sony is the red line, Canon blue, Olympus green, Panasonic yellow; BCN only publishes the top three market shares, thus the incomplete lines for Canon and Panasonic). 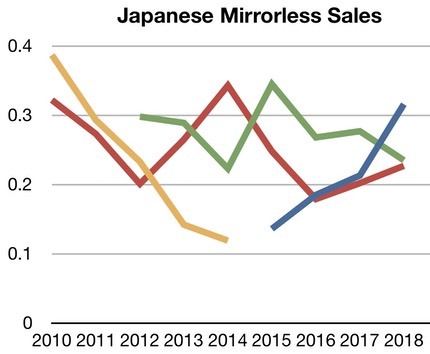 Note the last time Sony took the lead in mirrorless sales in Japan, it was with the A5100/A6000, coupled with the A7S, plus the A7m2 sneaking a few additional units in at the end of the year. It seems to me that Sony's positioning themselves for another overall push now that they're winning the full frame mirrorless race. The A6400 itself seems to me to be an A6300 update, though Sony went out of their way not to say so. Same basic price point, mostly same features. The primary difference appears to be how 4K video is created (no longer cropped, and with full sensor oversampling), plus a number of things that Sony has done in firmware (better autofocus features and performance, interval shooting, HLG support, plus a slight cut in list price (at US$900 for the body now, instead of US$1000)). Personally, I like Sony's engineering aggression. They're continuing to push a lot of horsepower into small forms and of the Big Three camera makers, they're arguable the one that is iterating the strongest now, despite what I'd consider a lukewarm A6400. What I'm less convinced of is whether Sony is getting the UX (user experience) right. From the original NEX models back in 2011 we've had a long progression of tinkering with the UI and controls, but I still find them sub-optimal and bit too gimmicky as opposed to pragmatic. The A9 remains the most accessible of the bunch from a serious shooter's perspective, but it, too, has the sprawling menus and tiny button syndrome that plagues the entire A lineup now. The A6400 doesn't seem to do anything to address the UX problems. The good news for Sony is that Canon has been fiddling with UX, too. The EOS M and EOS R have lots of differences to the well-established Canon DSLR UI, and the R in particular feels unfocused to me in handling while shooting. The bad news is that Nikon pretty much nailed things with the Z6/Z7 UX—though with some simplifications from the DSLRs—and if Nikon starts rolling more mirrorless models that are as well considered as their first two on the UX side, that will eventually pose a threat to Sony's eight-year head start. So, the A6400 looks like a solid product that puts a bit of new energy into the APS-C mirrorless realm again. If the A7000 soon follows, that's a pretty potent punch that's going to give Canon some headaches trying to match. If I'm right about what a Nikon Z5 will end up as (basically a mirrorless D500), Nikon will end up the company Sony has to pay attention to. Canon can't really match what Sony's doing in APS-C with the EOS M line the way Canon's defined M. Canon's attacking too low, and with no compatibility with their higher R product. Some are going to read what I just wrote as predicting the ILC race going to Sony, with Nikon in second and Canon declining to third. Nope. The DSLR/mirrorless mix still favors Canikon for the next two to three years no matter how well anyone executes in mirrorless. That's enough time for both Canon and Nikon to start delivering some real mirrorless salvos that Sony needs to brace for. As an aside: Sony continues to troll Canon/Nikon announcements. For example, Nikon used CES to talk very briefly about Eye-AF coming in a fall firmware update, but Sony one-upped Nikon by pre-announcing Animal Eye AF and other AF improvements for the Sony A7Rm3, A7m3, and A9 and did so with far more detail and clarity. (The Sony firmware updates will arrive in April; Nikon's "by fall".) I've said it before: Nikon really needs to up their marketing game. It's like watching a freshly-minted MBA graduate try to punch against a Fortune 500 company that has its act together.